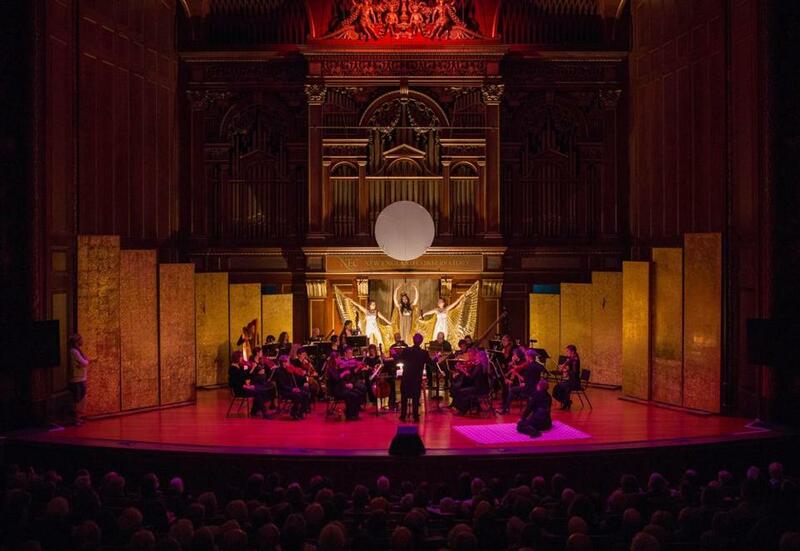 Boston Baroque performing “Giulio Cesare” in Jordan Hall on Friday. It’s critical convenience to cast one eye on operatic performance and another on operatic production; ideally, both combine into a seamless view. But sometimes the duality is inescapable — as with Boston Baroque’s presentation of George Frideric Handel’s “Giulio Cesare” in Jordan Hall on Friday, a mismatch of musical accomplishment and directorial deficiency. It’s hardly necessary (and often a hindrance) to treat opera with reverence. But Mary Birnbaum’s staging, in too many ways, was actually adversarial, working against its source material, seeming to regard it as merely silly. Nicola Haym’s libretto might shoehorn the historical story of Julius Caesar’s alliance/dalliance with the Egyptian queen Cleopatra into a boxful of Baroque conventions: palace intrigue between Cleopatra and her brother Ptolemy, a plot against Ptolemy by Cornelia and Sextus, wife and son of the slain Roman general Pompey. But Handel’s music finds that most incisively human of composers at the top of his game, embodying authentic shades of emotion with uncanny ingenuity. The staging didn’t trust any of it, arias glutted with overlaid business, some of it amusing, much of it incongruous, most of it gracelessly monopolizing space for Handel’s score to work its magic. A modern veneer — Amanda Seymour’s costumes ranged from Edwardian sober to discotheque pharaonic — functioned largely as an excuse for more contemporary modes of directorial graffiti, culminating in Cleopatra’s “Da tempeste,” the queen’s deliverance winked at with off-putting, coquettish mugging. What few places the drama actually took hold were, not coincidentally, where minimal directorial intervention left room for the singers to just sing. Indeed, while the staging failed to render unto this “Caesar” its own, the singers and musicians assuredly rendered unto Handel what was Handel’s. Susanna Phillips partially mitigated Cleopatra’s trivialization with fine-spun vocal richness, whether in coloratura spectacle or (as in a particularly affecting “Se pietà di me non senti”) stillness. The three countertenors were excellent: Lawrence Zazzo, as Caesar, in intriguingly plummy, satiny-edged voice; John Holiday’s Ptolemy a bright, strong vocal presence, with splendid reserves of color; and Douglas Dodson, as Cleopatra’s courtier Nirenus, matching clear, easy sound with welcome initiative in delineating character. Mezzo-soprano Jennifer Rivera projected similar poise, finding variety in Sextus’s despair with steadfast musical elegance. David McFerrin, as Ptolemy’s right-hand man Achillas, displayed a baritone of deft and appealing posture; Ann McMahon Quintero’s Cornelia draped determined fierceness in a dark-hued contralto mantle. Even tenor Jacob Cooper, in the small role of Curius, exhibited polished care. One expects conductor Martin Pearlman and Boston Baroque’s orchestra of adepts to hit their marks with aplomb, but Friday’s performance also conjured so many moments of unflappably expressive eloquence as to reinforce the sense of lost opportunity: a fine, confident “Giulio Cesare” trapped behind a distracting scrim. Often the best response was to close one’s eyes altogether.